Caleb “C.J.” Pine has been named valedictorian of the 2017 University of Notre Dame graduating class and will present the valedictory address during the 172nd University Commencement Ceremony on May 21 (Sunday) at Notre Dame Stadium. Named a Truman Scholar and a Gilman Scholar while at Notre Dame, Pine is a member of the University’s Glynn Family Honors program and is a Hesburgh-Yusko Scholar. A member of Phi Beta Kappa Honor Society, he carries a 3.92 cumulative grade point average, and will graduate with degrees in Arabic and peace studies and a minor in philosophy, politics and economics (PPE). Pine, who was raised in Tianjin, China, spent two semesters studying abroad while at Notre Dame, first during the spring 2015 semester at Tantur Ecumenical Institute in Jerusalem where he also volunteered to teach English at a Palestinian refugee camp. In the spring of 2016, he attended Princess Sumaya University of Technology in Jordan. His undergraduate research and much of his extracurricular focus has been on the plight of refugees and working to improve interreligious dialogue and understanding around the world. 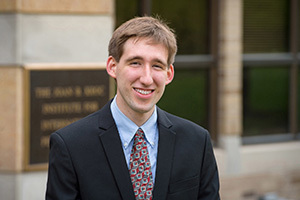 Last summer, he worked as an intern for the U.S. Department of State’s Office of Religion and Global Affairs where he researched religious dynamics in Burma and also worked with U.S. religious communities to support refugee resettlement. Pine organized the student advocacy group Solidarity with Syria and an awareness campaign directed to counter Islamophobia on campus. He has also tutored Iraqi refugees in the South Bend community and taught a course to South Bend Community Schools’ third-graders on conflict-resolution for the Take Ten program. Pine has served for two years as an international ambassador for Notre Dame International, where he organized and led international student orientation and was prominently involved in the student safety summit for Notre Dame students studying abroad next year. A four-year member of the Dean’s List, Pine is a founding member of Road to Mafraq, a nonprofit organization that seeks to increase access to education for children impacted by conflict in the Middle East, specifically supporting Syrian and Iraqi refugees living in Jordan. After graduation, Pine plans to work as an intern at the Bureau of International Organization Affairs within the State Department in Washington, D.C. This year’s salutatorian is José Alberto Suárez, a computer science and engineering major. Also a Hesburgh-Yusko Scholar who has a 4.00 cumulative grade point average, he too has been a four-year Dean’s List honoree. As the salutatorian, Suárez will offer the Commencement invocation and will be prepared to deliver a valedictory address should the valedictorian be unable to do so. 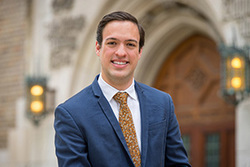 A native of Monterrey, Mexico, who also spent much of his childhood in São Paulo, Brazil, he is a resident assistant in Keenan Hall and a member of three University honor societies – Tau Beta Pi (engineering), Upsilon Pi Epsilon (computer science and engineering) and Eta Kappa Nu (electrical engineering). Fluent in three languages – Spanish, Portuguese and English – Suárez has been involved for four years in the Student International Business Council, and currently serves as president. He led the development of two new divisions within the council to better expose students to the current culture and dynamics in the business world. He also created new international partnerships with the University of Oxford, Brazil’s Unicamp University and Universidad Catolica Santa Maria la Antigua in Panama. Suárez also engaged in two international experiences as an undergraduate. He took part in the London study abroad program last year, and during the summer of 2014, he participated in the Kellogg Institute summer internship program at the Foundation for Sustainable Development in Salta, Argentina. While there, he planned a series of workshops for local entrepreneurs and organized year-long mentorships between entrepreneurs and employees of Argentina’s largest bank. He worked at McKinsey & Company in Chicago as a business analyst last summer and was the company’s diversity leadership intern in 2015. Following graduation, Suárez plans to return to McKinsey & Company to work as a business analyst. Originally published by Sue Lister at news.nd.edu on May 03, 2017.